Our Client Chris wanted to copy our Gloss It Porsche GT3…. He wanted an identical copy of our Gloss It Car! We told him that it wasn’t possible, what we did next was even a sweeter deal! As you know, we have hundreds of cars coming through our facility here in Las Vegas and every car has a story and we’d like to share the stories because that’s what makes us unique and our relationships with the things that we do here, from customization to paint correction to powder coating. One particular story that kind of stands on my mind is a recent one. Client’s name is Chris. 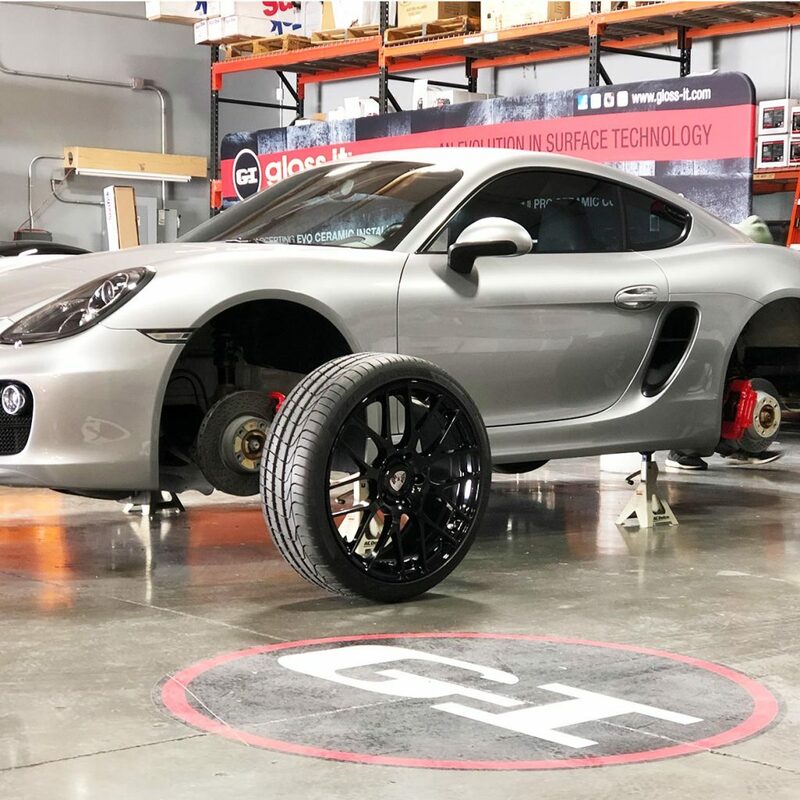 He came in to the facility to get some work done on his girlfriend’s car…We walked into the back of our facility, and saw all the cars on display, his attention was caught by the company Car – Silver “GT3″ and fell in love, basically asked me, “Can you make my Cayman S look like that? And I said You wanted identical? Well, I don’t want to make it identical because that would be copying us 100%, but I tell you what, I’ll make it very, very similar but to be a one-off spin for you. You will only see one of these cars….He said deal. Let’s do it! The next day, drops off the car. We go to work.. The process began – we first take wheels off the car & calibers. We paint the wheels – initially they were silver, so we powder coated black. Okay, what are we going to do with the bottom? Obviously, it has a stock bumper on it – He wanted a rear wing, some of the side skirts and the rear balance. This is kind of fun because this was a different type of story, because he’s had this car something to do with his dad, and he wanted to talk about how his dad took this long drive in the car and it’s just full of memories. This is what we do here. We help build stories and make memories with cars we help transform. Gloss It is not just a car care product line or a tool line. We become a lifestyle. Want to Transform Your Car? We are in the business of facilitating a transformation you won’t believe. Every Design Job is unique, and will need a custom estimate. What would you like to get done?